At this point, our AroundMe app is missing just one final feature: the ability to randomly change the lock screen to one of the pictures we've selected every few moments, even if the AroundMe app isn't currently running. This functionality requires we use a Scheduled Task Agent. The Scheduled Task Agent runs in the background and executes at specific intervals even when our program is not in the foreground -- in other words, when it is not the app you're working with on screen. In our case, we'll schedule the task to run every 30 seconds. When the scheduled task executes, it will call into our LockScreenHelper class' SetRandomImageFromLocalStorage() method. To enable this functionality we will add a new Windows Phone Scheduled Task Agent project to our current solution. This poses a problem ... we will need to execute the code in our LockscreenHelper.cs from our new project. However, currently this file (as well as its dependencies, the FlickrImages.cs and Photo.cs class files) reside in our main project at the moment. We could merely cut, copy and paste the code files so that they reside in both projects, however the better solution (from a code maintenance perspective) would be to create a third project, a Windows Phone Class Library project, that will house the shared code files, then reference it from both projects. We typically want to share code rather than duplicate it so that any changes or updates can be made in one place and shared by all dependents. We'll add a new Windows Phone Class Library project in our solution and will move our three class files into it that will be shared between the other two projects. We'll move those code files into the Windows Phone Class Library, we'll use NuGet to add in Newtonsoft's JSON library and the Microsoft.Net.Http library package, we'll clean up the namespaces and so on. We'll create references from the AroundMe project and the Scheduled Task Agent project to our new Class Library project. In the main AroundMe project, I'll need to introduce the Scheduled Task Agent to the operating system by launching it when AroundMe starts up, and configure the WMAppManifest.xml to be an extension in order to allow our app to be a Lock screen Background Provider. And if all goes well, we'll run it and watch the fireworks. I'm not going to submit this app to the store ... we've already seen that process in lesson 23, but I will show you some last steps required before submitting the app to the store, including how to get a token to properly license and use Map Services in your Phone Store app. You should now see a second project in the Solution Explorer. The most important part of this project is the ScheduledAgent.cs class. As you can see, I added a TODO. We'll come back here later and add code that will set the random image from local storage. We have a little setup work to do first. ... is merely for testing purposes in the Phone Emulator. This allows developers to watch the behavior of the task every 30 seconds. Otherwise, as we'll learn in a moment, when our app is deployed to a real Phone device, it will only run once every 20 to 40 minutes. More about that in just a moment. That article is very important for our purposes, and if you think you need to do some background processing or scheduled processing, you MUST read that article. In a nutshell, there are two types of background tasks: ResourceIntensiveTasks and PeriodicTasks. Resource Intensive tasks run in the background because they may take a long time to complete ... they're processor intensive. PeriodicTasks run at set intervals. In our case, we're creating a PeriodicTask. An application may have only one background agent, and only one instance of the agent runs at a time. Our task will run about every 30 minutes, however the phone's operating system decides when to run the tasks. In fact, it might run ALL scheduled tasks at the same time because it's more efficient to use the phone's battery once every 30 minutes than a bunch of times during that same period for each individual Scheduled Task that wants to run. So, that 30 minute time frame can drift as much as 10 minutes in either direction. So, when we deploy our AroundMe app to a phone, it will change image every 20 to 40 minutes or so. Our Scheduled task can only run for 25 seconds before it is shut down by the operating system. That shouldn't affect us, but we should be aware of that for future reference. If the battery is low and the phone goes into Battery Saver mode, then our Scheduled Task may not run at all. If you have a Windows Phone 8 and your batter gets low, you'll see a little heart icon over the battery meaning that it has shut down scheduled tasks, turned off some of the functionality of the phone like the GPS and Bluetooth radio and more. Users can configure how aggressive they want Battery Saver to be in the Settings screen. I have a battery monitoring app on my start page, and I was getting low on battery, then I noticed that Battery Saver mode kicked in and I had 20 hours left. That's because it was throttling what was going on in the background. So, be aware of that when you create your own Scheduled Tasks. Finally, depending on each phone's configuration, there may be a limit to how many background agents can run at the same time. A few days ago I hit that limit and it asked me to choose some background tasks to shut down because the phone was low on memory. So, if you plan on submitting a phone to the Store you'll need to be willing to support users. If you want to support your users, you'll need to know a little about how the phone and the operating system work with your app. If the user complains that their background is not changing often enough, you might want to ask a few questions about how many apps are currently running. To see what's running in the background, go to your Windows Phone's settings, swipe over to the applications page. There you will find "background tasks" setting at the top of the list. Once inside the settings, you'll see a list of all the apps running in the background. To shut it down, just tap on the app and tap the "block" button. To confirm that you've shut down the app, press and hold the back button to view any open apps. "When the agent is launched, the operating system calls OnInvoke(ScheduledTask) ... When the agent has completed its task, it should call NotifyComplete() or Abort() to let the operating system know that it has completed. NotifyComplete should be used if the task was successful. If the agent is unable to perform its task – such as a needed server being unavailable - the agent should call Abort, which causes the IsScheduled property to be set to false." So that is the purpose of the NotifyComplete() in line 63 of the code snippet above. Again, we'll come back and revisit the TODO comment in line 45 after we've moved our class files from our main AroundMe project to a new Windows Phone Class Library project, which we'll do next. NOTE: I deleted the Class.cs file from the new AroundMe.Core project. We won't need it. Selected it and hit the delete key on your keyboard. ... from the AroundMe project to the AroundMe.Core project. THIS WILL MERELY COPY THE FILES ... you now have two copies of the files. Next, since these files depend on third-party or optional packages, we'll need to use NuGet to import the into our new AroundMe.Core project. If it's not already open in Visual Studio, go to the Tools menu, select Library Package Manager menu option, then the Package Manager Console sub menu. ... your references should match what I have in the AroundMe.Core project. ... assuming everything builds without any errors, we're ready to reference our new Windows Phone Class Library project from our main AroundMe project and the Background Task Agent project. Now it's time to clean up our AroundMe project's source code. When you move things from one project to another, there's bound to be some problems. In our case, we need to comb through our code and make sure our AroundMe project can find the same code in the new AroundMe.Core Class Library project. ... and it tells me: "AroundMe.LockScreenHelpers is inaccessible due to its protection level". When I see the term "protection level", that usually means a visibility problem ... in other words, our old code can't "see" our new code. And usually that's because I'm missing an accessibility modifier in the new code. At this point you may need to re-build the AroundMe.Core project in order for the warnings in the SearchResults.xaml.cs class to go away. After I make that change, I Build the AroundMe.Core project again. ... to my using statements, that should fix any namespace problems I introduced with this change. In that same file, in the OnInvoke method near the bottom, it's time to revisit the TODO comment we added earlier. Add the async modifier to the method declaration. We've talked about this at length in lesson 27. Finally, we'll need to register our new background scheduled task agent with the operating system. We'll do this when our AroundMe app first starts up, so we'll be adding the code to the App.xaml.cs which handles the Application_Launching event. Lines 65 - 72 -- Here we are trying to find any running versions of our background scheduled task agent. If it is running, we'll want to remove it from the ScheduledActionService which acts as a registrar for the operating system's scheduled tasks. Lines 83 - 90 -- Here we create an instance of our background scheduled task agent and register it with the ScheduledActionService. Why do we try to remove it, then re-add it? Keep in mind what we said earlier ... after 2 weeks, our scheduled tasks will be de-scheduled. This little dance simply keeps our background scheduled task agent scheduled and operating for another two weeks. Notice that we set the task's Description property in line 84 ... this will be displayed to the end user if they look at the background tasks in Settings at the very bottom of the page where you can choose to block the app. It's a good reminder to the user of what this particular background scheduled task agent is doing ... in case they've forgotten that they installed your app. In line 88 I'm creating this LaunchForTest() method like I did in the AroundMe.Scheduler to schedule the background task for its first execution for development purposes in the Phone Emulator. Lines 74 - 81 -- this is a reminder to me and you ... we'll need to open up the WMAppManifest.xml file and add this ExtendedTask element. Simply leave the "auto-detect" option and click OK.
"The ExtendedTasks element is a child of the Tasks element and contains BackgroundServiceAgent elements. This element defines the use of multiple tasks by an app. Extended tasks are named by the developer. Currently, you can use the ExtendedTasks element only to define background tasks." Remember, the WMAppManifest.xml is there mostly for certification purposes into the Store, and is used to introduce your app to the phone's operating system and allow it to become part of the phone's ecosystem. Here's a great example ... we tell the phone's operating system that we want this part of our app, the AroundMe.Scheduler to be included with the other background task agents that are currently running. We're registering with the background task agent scheduler to let it know what we want it to run within our app, namely, the AroundMe.Scheduler, we give it a name, a description and so on. Now we should be able to run our application in the Phone Emulator to see it at work. 5. Run the app in the Phone Emulator to make sure it works. You merely need to unlock the Phone Emulator's lock screen by hitting F12 on the keyboard and / or use the swipe motion to unlock the phone. Then you can re-run / debug the app. To test this, you just need to go through our usual script ... i.e., search, select a few Flickr images, click the Set button, approve the dialog boxes that appear, then hit the F12 key on your computer's keyboard twice to simulate clicking the phone's power button twice to lock then awaken the phone. Undoubtedly your photos will look different from mine. After 30 seconds (maybe a little more, maybe a little less) it should change images to another of your selections. And so we've completed the development of our project successfully! But wait, there's just one or two more things we need to do before we submit this for inclusion in the store. There are a few final steps that we would need to take before we're ready to ship this and submit it to the Store for inclusion. First, you'll recall in this lesson we used the LaunchForTest() method a couple of times to test the scheduled background task agent. Remember this? NOTE: You may have to be creative and try different wording to find a group or evangelist near you. Developer evangelists usually have blogs, twitter accounts or mailing lists through MSDN or TechNet that you can subscribe to in order to learn about meet-ups, user groups or code camps in your local area. Or you could always write the developer evangelist an email and introduce yourself. Once you're ready to submit to the store, you should pay particular attention to the APIs you'll be calling. For example, we used the Windows Phone 8 Maps control and Flickr. Make sure the account you're using is up to date, and you're using the correct credentials. ... this is where you would retrieve the token and the application id required to the use map services in your app. You would merely replace those literal strings with the supplied tokens from the store. To recap, the big takeaway was how to create a scheduled task and share common code in a library, and how to test the scheduled task in the Emulator. We also learned about final steps, not the least of which is how to receive a token for Map Services. 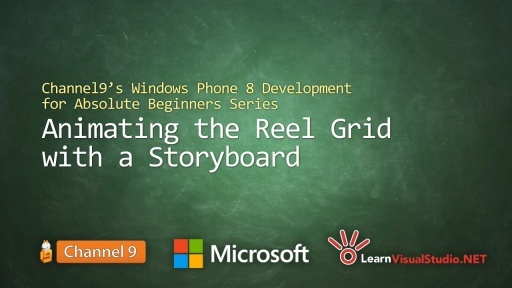 In the next lesson, I'll have just a few comments and will wrap up this series. "In my LockScreenHelpers.cs file I add the public accessibility modifier to the class declaration:"
has been switched with the one from paragraph 4 further down the page. 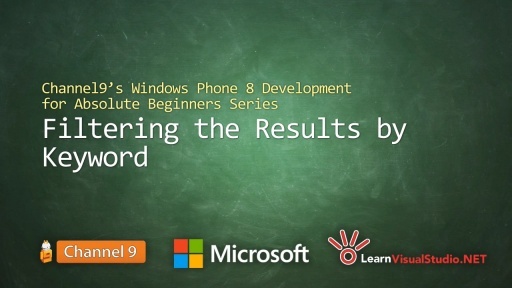 Are you going to put together a series for Advanced Development? 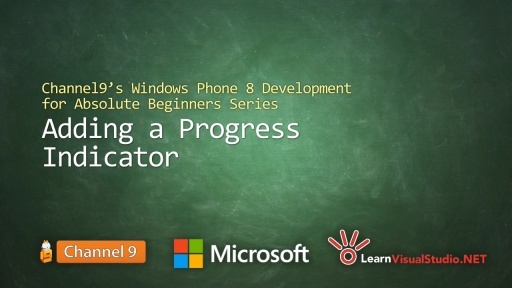 I love these videos and although I've been doing iOS and Android development for 2+ years, my first attempt at a Windows Phone 8 app is a struggle as I feel documentation is sparse (especially for WPtoolkit et al). @tbarrasso: for items like the Coding4Fun Toolkit and Phone Toolkit, most of the documentation is from the actual sample application that is included with the source code. I know personally with the coding4fun toolkit, it is a todo on my list of things to get done but good documentation is a lot of work and takes time! When I run app, the File Not FoundException was unhandled. I think maybe Change Background Task run before any file was set to IsolatedStorageFile. I fixed it because of I do not set Source for BackgroundServiceAgent correctly. @Clint:That makes sense, thanks! Looking forward to documentation improvements, and if not perhaps more comprehensive samples. Most of the sames only show one or two items and often in their simplest forms (i.e. ContextMenu does not have a sample that shows it being used properly with a LongListSelector). I'd love advanced and "putting it all together" samples. @tbarrasso: the community has a ton of samples and documentation on both coding4fun toolkit and phone toolkit. Why should ScheduledActionService.LaunchForTest() be called in 2 different places, in the Invoke event handler of ScheduledAgent and in Application_Launching event in App.xaml.cs? Please clarify. @Clint: I understand it is for pure testing. But even from a testing perspective, what it does mean when it is called in the Invoke event handler of ScheduledAgent vs in Application_Launching event in App.xaml.cs? And why was it done in both places in this demo? Sorry, I am still not clear why LaunchForTest() has to be called twice for this demo to work. Looks like Microsoft has not done a good job on this. They should provide a cleaner solution for this. Also, since it gets called only in Debug mode, how does the agent get launched automatically in release mode? What will be the delay time used in release mode? May be I am missing something here. Sorry I am still confused. @Geetha: Let me rephrase this, I [I created both samples] added those lines in for testing. I found having both there were useful so the background service would constantly fire off along with instantly fire off when I started the application. I think this approach of using Client library for the app and the scheduled agent work only if the client library is stateless. How do we share the same instance of the client library between the app and the scheduled agent project? I expected 23 to be returned, but what I got was zero. The reason why I am doing it is that my client library stores some data to the local database. And my periodic agent needs to query the data from the database. When my periodic agent runs, it doesn't see the data set by the app. I believe the client library creates another database when it is referenced by the scheduled agent app. Any idea how I overcome the problem? @Aravind: Let me start by asking which database you're using? Is that a common behavior of that database? Perhaps THAT'S the problem. If you could revert back to a text / xml / json file or something you can control in a central spot in the app's folder structure, you might be able to overcome this. My solution personally would be to utilize Azure in some way, but again, that's just me and it may not fit every circumstance. You're probably right ... there are two instances of that class being created. But being "stateless" doesn't sound like the solution alone ... the things we were doing in our example were ATOMic in nature. I would test the behavior of the database and see if it indeed creates multiple instances and if there's a way to avoid that behavior in settings / etc. Good luck! I've never tried what you're doing, so you're breaking new ground here. Right now all the DB code is buried in the client library and the client library stores some data to the DB. What I am doing right now, read the data and post it to an endpoint. Every thing works fine so far. I read upon background tasks lately, thought of implementing with using periodic task agent to see if there are any data in the DB.If it is, then read them from the DB, post it to an endpoint. This way I would be sending all latest data stored in the DB to be sent to the server. I spent some time and found that the DB is actually shared when you refer the client library with the phone app and the scheduled task agent app. In the client library I have a flag which I have to enable which I did in the phone app, but not in the scheduled agent app. As the flag was false, it resulted in nothing and I thought it created a different DB entirely. Still I am not convinced with the way we got to add the client library to both the apps. Let's say I internally maintain a flag which is set by the phone app. Based on the state of the flag, let's say I need to run something in the scheduled agent app, it will never work as the client library runs as 2 different instances. client.getFlag(); then I won't get the value set by the app. Anyway Windows 8 development is really interesting and I like to develop a lot. @Aravind: So first, we're here trying to keep questions on the video. Next, what I think you're misunderstanding how a static works along with how your application and the background service live. The background service is separate. It gets brought up / down by the operating system. It does not always live in memory just like your application won't as well. Thanks, Clint for your quick response. I may have used a bad example to explain the scenario above. My thought was that why we need to have a separate background agent project to be created to support the background task feature. I am curious to understand why it is created as a separate project? What I see in the project is a single class that extends another class and we put the biz logic in the OnInvoke() method. Cab't this class be embedded as part of the client library or the app? And annotate the class so that the OS knows the class is for running background jobs, treats it the same way as it treats the background task app. Anyway there must be some valid reason behind this approach (creating a new project of type windows background) and I don't want to comment on it. In my case, the client library stores some data in the DB and the dispatch timer runs every few minutes to query the DB. If data is present, then it submits the data to the server. If there is no data, then it stops the timer so that the timer doesn't run all the time to go query the DB. When I insert a row of data, then I turn on the timer. Coming back to the background task, its job is to go query the DB to see if there are any data in the DB and submit it to the server. For example, if my timer runs every 5 minutes and a user uses the app for a few minutes and backgrounds it, the timer never gets a chance to run. In this case, the periodic task running every 30-40 minutes will query the DB, submits data to the server so that I am not losing any data. I wanted to set a flag which indicates if the DB is empty or not. I wanted to preserve it in memory so that when the flag is true, the periodic task just reads it and doesn't do anything than go query the DB and make an expensive call. And this flag is set when the app is running. Background Task -> Client Library -> Read isDBEmpty. When it is True, don't do anything, just exit. If it is false, query the DB , submit to the server. This should have worked when the ScheduledAgent.cs is part of the library itself with some special annotations telling the OS it is background and the flag set is visible to the ScheduledAgent class as well. Anyway as you suggested, either I have to either set the value in ISO / app settings or query the DB to set if there is data in there. PS: All your video tutorials made me learn .Net and Windows in no time. Thanks for sharing all these. I'm developing a new app that will download than then change the image on the lock screen (that works great). Know I would like to be able to put text in the upper part of the lock screen but I don't know how that is done. For example how to the weather apps do this? two great spots are www.stackoverflow.com and the forums over at http://dev.windowsphone.com for questions like these! I have everything you have, but when I test it on my device the wallpaper is not changing at all. Any tips on what could the problem be?? @Clint Yes it did. it changes the first time but the background task never seems to execute and I have it enabled and all. @Richard Garcia: can you zip up your solution and create a bug over at https://absolutebeginner.codeplex.com/WorkItem/Create so I can do a quick glance with a debugger. i have created the agent and am setting the images to live tile form service but as image size is large those images are cutting on tile.Is there any solution to fit large image to tile from scheduled task agent? @pari: thought our version properly gave a smaller version of the image for the tile. You can do a writable bitmap and resize the image accordingly is an option or get the properly image from flickr. I am trying o create a app with the concept of Scheduling the SMS, and I see most of the apps display the popup and user had to interact with device to accept and send. is there any other option such as create a task at background and send out SMS / Email. @raghuramr4: SMS and email use tasks and require the user to do the final consent. You can use an external service to accomplish this if you choose. 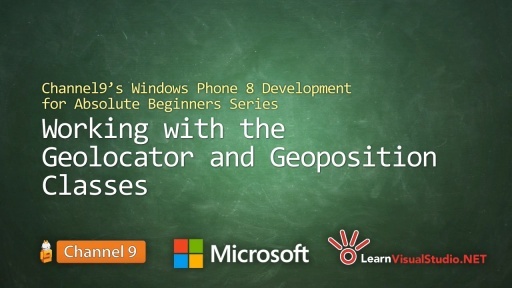 1- Your app must provide in-app settings that allow the user to enable and disable your app's access to and use of location from the Location Service API. I'm just curious if this is applicable to all apps that use the location service. @Mark: We intentionally didn't cover any store submission stuff as it can change. Makes supporting a video series hard since updating can change context of the past comments. I downloaded the source code from the above links, but when i tried to run the app, it starts fine, but while searching for the images it stops with an error with an unhandled exeption occurs. Please help. @Varij: can you be a bit more descriptive of he exception? @Varij: I just downloaded and ran the code (in emulator) for lesson 34. It didn't throw an exception. Hi, I am using SharedMediaTask in my app. But if I use button of data template & do the same on its click navigate->page with images->select one of the image -> share using ShareMediaTask the app crashes saying "System.Runtime.Serialization.debug.resources.DLL'. Module was built without symbols." Your tutorial is really great, I've just successfully build this app. But i recognize that the Tile doesn't change, did I do something wrong? or this is it? @Seke1412: You mean the lock screen doesn't change? If so, then you may have to wait a while for it, and / or (b) restart the entire process ... restart the debugging session, restart Visual Studio, restart your computer. (c) Try deploying to your device. It works (assuming you've got the code and the project correctly configured) but I did notice some lag the first time I ran it. @Seke1412: are you sure you added the few lines into the WMAppManifest.xml file? Did you set a break point to see if stuff is actually firing in the worker role? Hello, I have my tests running against Windows phone 8 and the tests doesn't execute when the screen locks and would like to have the device not lock at all. When my windows phone 8 application page is on the foreground, the screen doesn't lock at all but when it moves away, the screen gets locked after the lock screen time set in the phone settings. So, I'm trying to create a backgroundagenttask to check whether the state of the screen is locked and if so to unlock it. Is this possible? Note: I tried Idledetection mode of PhoneApplicationService to disabled but it doesnt work, when the focus is moved from the application page. Could you please share your thoughts? The ExtendedTask Element in WMAppManifest.xml is automatically created if it´s referenced in the Windows Phone 8 project. Why would you drclare it by hand? of the ScheduleAgent.cs OnInvoke method. This exception occurs in my code and the downloaded source code.